Chinese President Xi Jinping's recent visit to the United Kingdom (U.K.) is being touted as a game changer in two countries relationship. Xi's 4-day historic trip which saw two nations signing a spate of big ticket deals on trade, energy, infrastructure projects, financial management and the unveiling of investment proposals of massive proportion is likely to elevate once fragile relationship to an enduring one. 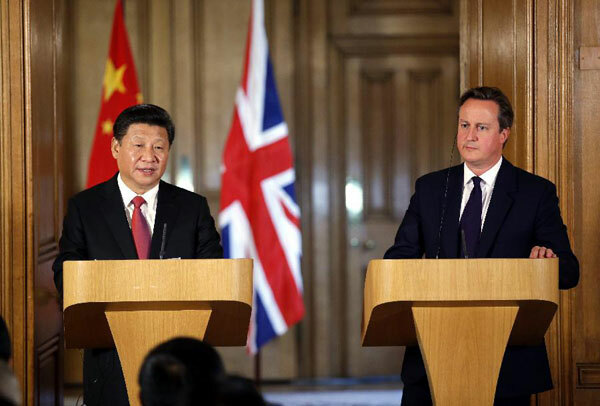 Sino-U.K. relationship which was on an upward curve for several years did suffer its gravest jolt in 2012. Prime Minister David Cameron's decision to welcome Dalai Lama to U.K. in May 2012 put a growing relationship in deep freeze. Diplomatic and political activities between the two nations came to a near standstill. What turned the table for relationship that was increasingly getting frosty and unpredictable? A convergence of common interests and realignment of geopolitics drove the leadership of two countries to leave behind the 2012 incident and build on the positives. Of course, the credit must go to David Cameron for repairing the strained relationship by taking a spate of proactive measures including paying a quick visit to China in 2013 and sending his Chancellor of Exchequer George Osborne to persuade Xi to visit Britain. Fact is more than China, it is Britain which needs to do business with China to lift its sagging economy and insulate itself from any major fallout of its possible exit from the European Union (EU). U.K.'s Chinese embrace is further motivated by its continued frosty relationship with the United States, its long-time soul mate and strategic partner. A deepened relationship with world's second largest economy not only provides the U.K. much needed business opportunities, the country can tactically play China card against the EU and the U.S. to fetch greater concessions on a range of issues. Thus, it is no surprise that the Cameron government was the first EU member to have joined the Chinese led Asian Infrastructure Investment Bank (AIIB) apart from allowing first yuan bond sale in London. The pomp and grandeur surrounding President Xi's reception in Britain recently is a reflection of the change of British attitude towards China. In the recent time, no other national leaders have had such rare honor of meeting so many British royals in one day. The positive convergence of geopolitics and geo-economics will drive the China-U.K. relationship to attend new height and meaning.